Sorry for the lack of news lately; this was caused by several matters, including my own laziness. ;) But I got some news for you. While the developers have been busy fixing bugs and doing other, more important things not related to STK, there is some stuff I haven't presented yet. All the buttons works like intended, and it's possible to go back to this pause dialog after changing the options or looking through 'Help'. As you've probably figured by now, it's possible to complete a race and get the results. While the results for the computer controlled players isn't shown, everything else seems to work. The SuperTuxKart forums is now located at http://ghoulsblade.schattenkind.net/freegamedev/forum/. The posts that were written before the forum crash is not recovered yet, but work is still going on as far as I know. I mentioned a few blog posts earlier that we were looking for menu icons. We have someone who are dealing with that for the moment, so if you want to partake with that you'll have to be quick and join the developer's mailing-list and get in touch. There'll be an alpha release of STK ready later on for artists to test and improve on. 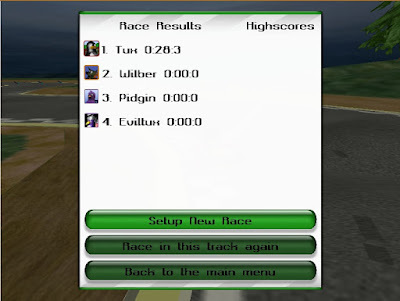 Note: As the "STK w/Irrlicht" branch is still in a very unstable state, the general public is recommended to use the latest stable version (0.6.2a) of SuperTuxKart. 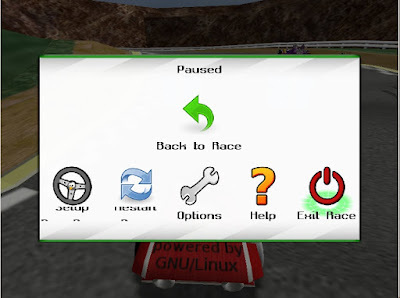 A binary of SuperTuxKart 0.6.2 for Solaris-SPARC has been made by Ten Little Indyans, and it can be found at the SourceForge download page. Just wanted to say what a great job I think you guys are doing!